Download this Project Management Book absolutely free, describing how to manage projects step-by-step. It also tells you how to manage people, time, budget, communications, risks and issues to successfully deliver projects from end-to-end. Valued at $19.95, you can download it here for free! 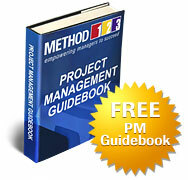 Enter your name and email address to download your free project management book. You will also receive our free weekly newsletter (click here to view a sample), providing practical Project Management tips and hints. You can unsubscribe any time. Note: To make it easier to download, we have compressed the file using Winzip. Get a free trial of Winzip from http://www.winzip.com/downwz.htm and email us at if you have any problems. By downloading this free project management book (guide / handbook / manual) for Project Managers, you will gain a detailed understanding of the phases, activities and tasks required to successfully deliver projects from end to end. Based on the worldwide standards for project management “PMBOK® and Prince2®”, this project management book defines a best practice process for delivering projects on time, within budget and to specification. If you gained benefit from using this free project management book then why not consider buying the Project Management kit to download the complete suite of project management templates which compliment this book?